NASCAR’s Kenny Wallace is the champion of the 2018 edition of the IWK 250. While Wallace crossed the finish line third on Sunday, official results distributed Tuesday evening show the top two cars of Cassius Clark and Dave O’Blenis have been disqualified by Parts for Trucks Pro Stock Tour officials due to unapproved carburetors, moving Wallace to first place. The fifth-place car of J.R. Fitzpatrick was also disqualified for an unapproved carburetor making the official top five finishers Wallace, Cole Butcher, Craig Slaunwhite, Braden Langille, and Nicholas Naugle. Wallace commented on the final results shortly after they were announced via his Twitter account. “This is an unbelievable turn of events for me. As I sit here at Eldora Speedway I just got the word… My official comment is… “I would have rather finished 3rd and those 2 teams in front of me be legal.. I accept the BIG WIN and I am incredibly honored”. The race started Saturday evening but was halted at lap 74 due to rain. It concluded Sunday afternoon. The stacked field included drivers from six provinces and two states. Competition got underway with five Atlantic Tiltload Heat Races for the 36 competitors vying to make the 30 car field. Heat races were won by Greg Proude (Springvale, PE), Braden Langille (Shubenacadie), Jason Hathaway (Stouffville, ON), Dylan Gosbee (Cornwall, PE) and Cole Butcher (Porter’s Lake). Kent Vincent (Crapaud, PE) won the Atlantic Tiltload B Feature. Twenty cars qualified for the prestigious event via heat races. Cars that did not qualify through their heat then competed in a 25 lap last chance race with the top two securing their positions on the starting grid. The remaining eight positions were determined by provisionals as determined in the event procedures. Langille picked up the Exide Batteries Rookie of the Race and the King Freight Lines Future Winner award with a solid fourth-place finish. 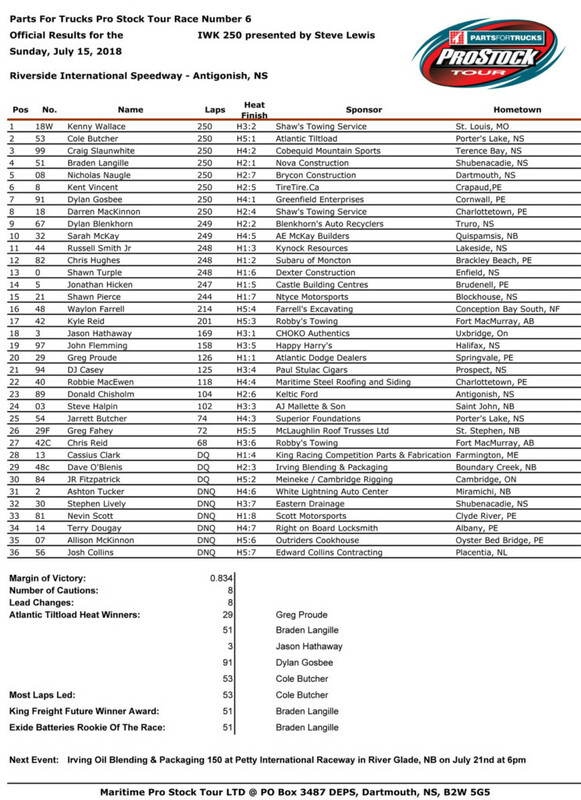 The Parts for Trucks Pro Stock Tour is in action next weekend for the Irving Oil Blending & Packaging 150 at Petty International Raceway, located just outside of Moncton NB. Management at Riverside International Speedway now turns their focus to the NASCAR weekend on August 17-18. Friday’s show (August 17) will see the Henry’s AUTOPRO 75 for the Napa Sportsman Series and the MJS Holdings Prime Lift East Coast Mini Stock Tour. On Saturday (August 18) it’s the Bumper to Bumper 300 for the NASCAR Pinty’s Series and the Maritime League of Legends. The Parts for Trucks Pro Stock Tour (PST) is considered the highest level of stock car racing in Canada visits five tracks throughout the Maritimes during its May through September season. The Parts for Trucks Pro Stock Tour is owned and operated by Maritime Pro Stock Tour Limited. For more information call 902.481.2531 or click www.maritimeprostocktour.com. You can also follow on Twitter atwww.twitter.com/prostocktour and like us on Facebook at www.facebook.com/prostocktour.